Over the years we all of us in production and post production have been trying to speed up our workflows. We struggle every day to get the most out of our PC’s / Macs to reduce time and costs. As we all know Time is money! Well all of that has now changed with introduction of Intel’s new second generation chips ( Sandy Bridge ) i5 and i7 chip sets. We have all spent many hours rendering and compressing footage. However that now will drastically change with these new Intel quad-core i5 and i7 with speeds twice as fast of the Intel Core 2 Duo. Combine that with Intel’s Thunderbolt providing you with an I/O ten times faster than FW800 and even faster than USB 3.0, time spent waiting is dramatically reduced. These new Sandy Bridge quad-core processors are designed with cache, memory, controller, and graphics engine on a single chip. This means if you are working with a processor intensive program such as Adobe Photoshop, or Final Cut Pro you get faster performance since the data does not have far to travel. 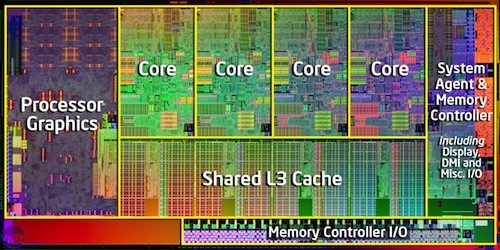 These new i5 and i7 CPUs also boost speeds the speeds of the active cores to 3.8ghz. This means to spend less time rendering, compressing, or even transferring large files from processor intensive applications. Intel seems to be on the right path with these latest processors. Just last year I did a review / comparison on the Intel i5 to i7 working with large 4k RED files. You can read that review here. Intel is now pushing the bounders on what we believe are fast CPUs to use for rendering and compressing. Even the iMac recently got refreshed with these new CPU’s and were able to playback in realtime several HD formats. It only started to stutter with RED 4k uncompressed. Playback had to be adjusted to half being 2K. That is still really impressive! Especially with the added bonus of Thunderbolt these latest generation of CPU’s make them irresistible. It has never been a better time to own one of these blazing fast machines, especially for those of in film and video productions. the only thing holding us back now is our won creativity. I will be sure to test out and review one of these new Intel quad-core machines in an upcoming blog so stay tuned. Until then enjoy this great video showing the power of the Intel i5 with the Penguins of Madagascar. Relays and vacuum tubes (thermionic valves) were commonly used as switching elements; a useful computer requires thousands or tens of thousands of switching devices. The overall speed of a system is dependent on the speed of the switches.